It’s fast, refined, and menacing. We’ve fallen in love. Curtains twitched as a Rolls Royce Black Badge glided silently down my road. It’s a day I’d been looking forward to for weeks - the first time behind the wheel of a Rolls Royce. I still couldn't believe I'm managed to persuade RR to loan me a car, while I am very sensible, the desire to recreate White Iverson was incredibly strong. Everywhere the Ghost goes it demands attention, it's an event, whether you're in a Tescos carpark or Soho Farmhouse. This is regardless of the understated all-black colour scheme of our review model. 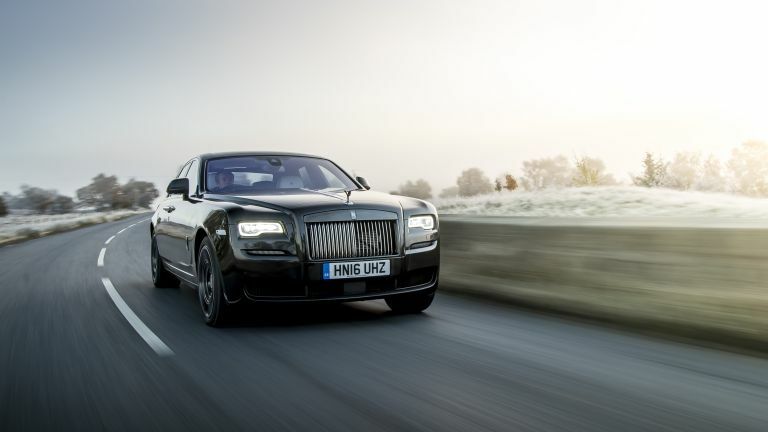 This is no ordinary Rolls Royce (if there is such a thing), the Black Badge suffix is applied to the brand’s darker, more edgy model variants. It sets itself apart with black chrome pantheon grill, a black Spirit of Ecstasy, black exhaust pipe, and black double R badge. It sounds like a lot, but the Black Badge additions are subtle, almost to the point of being invisible. It's exactly the way I'd spec it, and designed to appeal to a younger audience. There’s no denying that when you’re driving down the road with the dark Spirit of Ecstasy at the end of the expansive bonnet, it just feels cool and menacing. Those are the finer details, but what doesn’t come across in the images is how large and imposing the Ghost is. It may be the baby in RR’s range, but it still stands out in the car park, dwarfing lesser vehicles. Walk up to the Ghost, open the doors, and you’re enveloped by soft leather and surrounded by unrivalled craftsmanship. My Ghost was upholstered in bright blue leather. It’s a bold statement which smacks you in the face at first. Originally, I thought it was too much, but I quickly grew to love it. The dash is finished in RR’s new “Technical Fibre”. It’s a stunning material used on stealth aircraft, made using woven threads of aluminium and carbon fibre. It’s futuristic and technical, but also decorative and blingy. The real star (pun intended) inside the cabin is the Starlight Headliner - a constellation of roughly 1300 fibre optic lights in the roof. I don’t care if you think it’s a gimmick or tacky - it’s breathtaking and best enjoyed in the rear seats, which have acres of legroom, are almost fully reclining, and feature a strong massage function with soft pillow headrests. The media centre is controlled by two rotary dials (one in the front and one in the rear). It’s a lightly camouflaged version of BMW’s excellent iDrive system, controlling the music, phone, sat nav, and television. The cabin is a spiritual place to be, whether you’re in the front or back (preferably back). It’s impossible not to marvel at the quality of craftsmanship in every hinge, stitch, and join. It's not just the design that got an upgrade, the Black Badge also receives a performance boost, upping the 6.6-litre, twin-turbo V12 by 40bhp to 603bhp. Torque is also given a significant 60Nm boost to a tarmac shattering 840Nm. That’ll get you from 0 to 62mph in just 4.6 seconds. That’s impressive, but what’s more impressive is how quickly it goes from 70 to 80mph while overtaking. There’s just always power on tap, making it effortless to drive. The brakes have been uprated for more positive pedal feel, the air springs and dampers firmed up, and more eager throttle response and gearbox. Of course, it’s still not what you’d call ‘sporty’, but it’s more driver focused than other Roll Royce cars. While we’re on the gearbox, the Rolls Royce features a GPS-aided system, using satellite maps to preselect gears. Of course, the changes are so imperceptible it’s impossible to tell when they’re happening. But it’s a cool feature to boast about down the pub. The Ghost's speed isn't the most impressive thing about how it drives - it's how it glides over the road. I live in a rural part of Oxfordshire with roads that can literally shake out a filling, but somehow the Ghost managed to turn headache-inducing streets into fluffy marshmallow pathways. It's unbelievable. The most difficult part of driving the Ghost is when it comes to parking. Although there are plenty of cameras and sensors ensuring you don't have a very expensive accident, it's still very large, and can be difficult to manoeuvre. I'll finish with two anecdotes. The first happened when I was driving through a small village in the Cotswolds, stuck in a traffic jam. I pulled up beside a McLaren 720S, and exchanged a knowing nod with the driver. A nod which suggested we'd both succeeded in life, 'congratulations fellow rich man' (little did he know I'm a humble journalist). I don't think this would have happened if I was in a Mercedes S Class, BMW 7 Series, or Range Rover. And, on the final night of the loan, my girlfriend and I both climbed into the back seats, fired up the massagers, and gazed up at the fibre optic stars, pretending this was real life and this was our Rolls Royce. It's not an alienating machine, it's like home. If you can't tell, I became incredibly attached to the Ghost Black Badge. It's on a whole new level to anything I've driven before, and incredibly endearing.